Victoria Delgadillo » This is why I love LA! I am a transplant to LA, but have lived here longer than I have lived anywhere else. I suppose I am a native now. My story is that I am a love child of two native Angelenos. I think the love of LA and the love of the unconventional, was somehow planted in my DNA. I’m not kidding when I say that I can pass by the same place several times a week and see it differently each time. 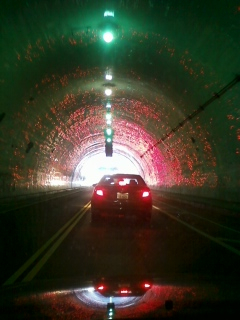 Today I went through the 2nd Street Tunnel going east and it was such a magical experience, I had to take pictures.